Postbox 3.0 has been released for both Windows and Mac users. This commercial mail client is aimed at those who rely heavily on email and who find the various free email tools, such as Thunderbird or the clients supplied by OS X and earlier versions of Windows too restrictive. Postbox 3.0’s headline new feature concerns tighter integration with numerous third-party apps and services, including Gmail, Dropbox and a range of popular social networks. It also includes handful of interface tweaks designed to take better advantage of new features in Windows and OS X, plus throws in a handful of minor new improvements. Postbox 3.0′s improved integration with Gmail promises native Gmail Label support as well as support for Gmail keyboard shortcuts and a dedicated view for mail marked as "important". Postbox 3.0 also integrates popular social networks, including Facebook, Twitter and LinkedIn, more fully. You can now access your profile pages directly from the app, plus Postbox can now import extra information from social network profiles, such as photos, job titles and workplaces. You can now email links from your Dropbox folder instead of the actual file, and use Date Detection to create events in supported apps such as Google Calendar and iCal. Postbox 3.0 also supports notifications from the latest version (1.3) of Growl. A smattering of new usability features are also present. The Favorites bar can now be used to quickly access those accounts and folders you use most, while clicking Quick Reply includes an option for quoting the original message as part of the reply. Send and Archive functions can now be performed in a single step, and reusable templates for message replies have also been added to the program’s feature set. Finally, version 3.0 also takes advantage of features in the latest versions of OS X and Windows. Lion users can now use gestures with their trackpad or Mighty Mouse, plus run the program in full-screen view, while Windows 7 users get to use jumplists and gain better integration with the app’s “popular” Minimize to Tray icon, which minimises the application to the Notification area of the Windows taskbar. 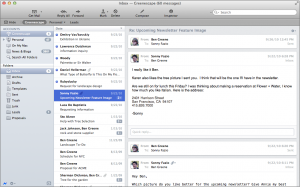 Postbox 3.0 is available now as a free trial download for Windows (XP or later) and Mac (OS X Snow Leopard or later). The full version costs US$29.95.